The 75km route is one complete loop of a challenging route and tests the strongest of riders with the two climbs and rolling roads from start to finish. The Munster Hill Climb Championships were held in Ballyorgan over the weekend with Southside Wheely Wheelers hosting the event this year. In a very successful weekend for the club Oran Pierse won the Junior event and Jerry McCarthy followed by winning the M40 category. Two magnificent wins and a very successful year for both riders. Well done lads!! I signed on at 10.45am in the hotel. I felt good but was unsure about what sort of form I was in after county TT champs on the Thursday. This was a 6.1km TT. I like time trials, they would be my strongest disciplinebecause of triathlon training. So I was looking forward to this even if the distance was a lot shorter than I was used to. My legs felt tired in the morning, I could feel the work from the day before lingering. I got advice from a few friends who told me about a few little things on the course to look out for. After the warm up I had forgotten about it I was in the so called "zone". I was on the line and I heard ten seconds. I could feel my heart starting to beat faster in anticipation. My thoughts were focused hitting maximum effort. Then I was off. I went off strong and quickly tucked down as aero as possible. I found it difficult to generate the power I wanted. I put it down to heavy legs but I wasn't sure, I saw the bridge I was advised to look out for and I drilled it as hard as I could. Then I could see the line and then it was over. I was worried. Very worried I didn't think it had been enough but I was going to have to wait to find out. We got the results from the TT about half an hour before the start of the last stage. I was surprised. I had moved up three places to 8th. The pressure was on to hold it. I was reassured by Oran and Jerry before the start that they would do what they could to help. We rolled out at half 12. Then it started. I felt surprisingly good. I stayed up as near to the front as possible to stay in touch with the moves. Most of the early moves were easily chased by Sean in yellow. Two riders got up the road, one was in the break with me the day before. Then he nearly got away with a group so I had to join in on some chasing but then he did get away. I was worried about him getting to the other two before the climb. Then we were on it. I wanted to attack I knew this was the place but timing would be important. I got this wrong the first time no one even thought about following me and I knew I'd need someone to work with. Then Darragh broke out of the bunch. He put a gap in. I reacted and started to close with a few chasers. Oran came to the fore to take up the chase with me for the second time bringing within touching distance. But then we were over the top. I knew the opportunity to get away was gone. I'm not a very strong descender and restricted gears don't help. My main concern was to stay upright. I did not want to come down. Not now, not anytime but especially not now. So I came down in one piece. Then we caught the group that was away. I stayed near the front for the finish and held my placing. 2 Ronan Leahy – Kanturk CC. In the youth racing Cian Smailes took the U16 title after a strong solo attack and finished well ahead of the other riders. In the senior race Barry Horgan and Jerry McCarthy performed very well and Barry was extremely unlucky to miss out on a podium place. Jerry McCarthy finished 3rd in the A3 category and Pierce Boland 2nd in the A4. Impressive riding yet again by both riders. The first two junior riders to cross the finish line were Tralee Manor West duo, Oran Pierse and Cillian Tierney. Cillian and Oran have raced impressively all season and more well deserved success to them yesterday. Congratulations to all Tralee Manor West riders today who yet again represented the club so well. Thanks to Sliabh Luachra CC for a well run event. David Fitzgerald was also presented with his 2nd place overall trophy from the Kerry County League. Congratulations David. 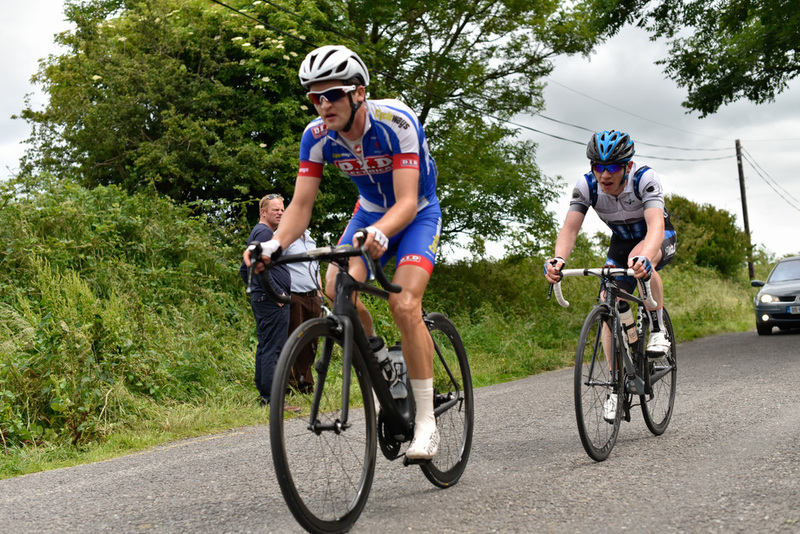 The Junior Tour of Ireland was held last week on the roads of County Clare. The 6 day stage race is the elite event of the year for Junior Riders home and abroad. Tralee Manor West BC riders and first year Juniors Oran Pierse and Cillian Tierney were selected on the Munster Development Team and put in a superb weeks racing. We asked the two lads for a rundown of their Tour so we could write a piece on it, but when we saw what they sent in, we just had to share it, brilliant stuff lads ! The first stage was a 6km TT. This was on July 14th. I also met up with the rest of the Munster team at the hotel. We arrived up, signed on and got our numbers 2 hours before the start. At 6.45pm I got my warm up done and lined up in my skinsuit. It was tough because it was so short but I was satisfied with my time of 9.15. This was a 109km stage and it had the most categorised climbs of any stage. This included Castle Hill, one of the toughest climbs of the tour. I stayed in the bunch up to the climb and got into a good position in the early drag part, then it kicked up and I went hard as possible. I went into the small chainring and weaved up through struggling riders and came over the crest second Munster rider behind Dion McCarthy and more importantly just behind the lead group of strong riders. I could feel the burn still in my legs but I chased hard with a few other riders from USA and Carrick Wheelers. We made the group. After that another chasing group got on including Oran. It was a strong group and we rolled along tipping 50km/h for the last 20km. I felt very good though and stayed near the front as we came into the last 2km. Then I heard a chain slip and looked down to see my chain had come off. I was devastated I fell through the group and tried to get it back on a car stopped and he helped it on and I was off. But the group was gone I went hard for the last km but still lost 30 seconds. We woke up to rain and an overcast sky. For the start the rain eased but it wasn't long returning after the end of the neutral section. The pace was fast and the group was nervous. There was a few small crashes near me early on but I wasn't involved. Then about 40km in, I could see the group brake hard ahead. I started braking hard too conscious of the wet road. Then the guy's wheels in front of me locked he skidded and hit road I braked harder to avoid hitting him but wheels locked and I went over him and hit the tarmac. I closed my eyes and I could hear more bikes hitting the road the carbon scraping against it. It hurt and I felt two other bikes hit me after the fall. Almost immediately riders were getting up to chase the fast disappearing group but I lay there, I had too much pain in my elbow and knee to move. Then a paramedic came and after some examination I was helped up walked to the side of the road. It was my first proper bunch crash and I had never seen the aftermath of bikes all over the road, riders standing and lying at the side, ambulances and team cars trying to get through. I just stood there for a minute or two. The driver of the Munster team car came up to me and looked at my elbow and asked my dad to throw the bike in the car but then I saw Conor from the team mounting and tearing off behind the team car. So I asked to continue, the front wheel was off at this point but it was put back on and I took off I could feel the stiffness that had set in to my hip and knee but the pain faded. I knew I had wasted a lot of time after the crash so I knew to catch the bunch was a big ask. I passed single riders and small groups averaging high thirties I knew I wasn't making time on the bunch. I lost 17 minutes in the end but I was happy to finish. I woke up still sore from the day before but nothing near bad enough to abandon. This stage was another tough one incorporating the Corkscrew Hill. My legs still felt strong and climbs suit me so I wasn't too phased. It was the longest stage of the tour at 115km with the biggest elevation. We started in Ballyvaughan and the pace was very slow at first then it started picking up. We were expecting the peloton to split at the Corkscrew but it happened a lot earlier on a less steep cat3. Wheels were dropped in the middle of the peloton. So now we were chasing to close the gap. We lined out single file on the descent. I was with Conor Murphy, another guy on the team and we descended as fast as possible through tough bends sometimes within inches of the ditch. We reached the bottom, the pace still high but we were now into an unrelenting block headwind. We knew we were fighting a losing battle. We hit the hill. I pushed hard and dropped the gruppetto of now around 30 riders. I could see the front group only one switchback above tantalisingly close but still unreachable then in the last drag of the hill my chain came off luckily right in front of spectators who got it back on. By now I was nearly back in the dropped group. We kept riding hard keeping the gap around the minute mark but we had only 9 rides working out of a large bunch. Soon the gap was reduced further and I worked hard to drop the group with another guy on the team, Darren. We were eating into the gap but tiring fast and soon the wind became too much and we fell back into the old group. For the rest of the stage we took it easy enough. Saving the legs as much as possible while some rode tempo at the front. We lost 14 minutes. At this point everyone was tired and we all had sore legs despite massages. This was a 101km stage. With two big climbs, Windy Gap and Gallows Hill. I felt good. In the first 10km, there was a crash in the centre of the bunch bringing a lot of riders down including teammate Kevin Winterburn. I stayed in the group and did some turns at the front with a few other lads from the team. When we reached Gallows the group was blown to pieces. I climbed as well as I could coming across the line in 25th position as the second Munster rider. I think everyone was happy to reach the last stage but it wasn't over yet we had 79km route to do. 8 laps of a lumpy route. The pace was very fast tipping over 50km/h on flat parts. I managed to stay in the group was happy with the finish and happy to be finished. It was a very tough 6 days but the experience was amazing with the racing and the off time with the team. The Junior Tour is THE race for all Irish Juniors and had been the focus of my training for several months. I had been selected on one of the Munster teams along with 14 others from the province. I packed the bike into the car and off I went, a bag of nerves on the road to Clare. We met with the team at the hotel before heading to the TT start. After building this race up so much in my head, I wasn't the calmest at the start, before my warm up and there was a bit of a panic when I started my warm up only to realise my rear derailleur had gotten a bang in the car and my gears were all over the place. After a less than ideal preparation, I took to the start line and was off, the adrenaline from the panic about my gears along with the tailwind helped me record a much quicker time than expected for 46th place on a stage which was always going to be my weakest. Stage 2 started with fresh legs. I attacked up the road and was actually making good ground on the lone leader until the US National Champion came across to me. There was no way the bunch was letting the stars and stripes jersey up the road so we battled on in a futile attempt to stay away but were quickly reabsorbed. The rest of the day was spent in the bunch dreading the infamous climb of Castle Hill. In focusing solely on that climb I neglected the Cat 2 beforehand and was almost spat out the back due to poor positioning. The narrowing of the road and the clink of chains dropping into the little ring signalled the start of the brutal ascent where the bunch was truly blown to pieces. The narrow roads made it near impossible to pass those poor riders who had blown their lights and I crested the top around 15 seconds back from what was left of the bunch as riders were strung out all over the road. After a regrouping a few minutes later, I managed a sigh of relief as I had made it back to a whittled down group of around 40. The sprint was next in mind but after being too far back, my legs gave up on me with 150m to go and I drifted in mid bunch satisfied with my performance. Stage 3 was a tough affair and I struggled over the climbs with poor legs, breathing a sigh of relief when we hit the pan flat final 30km and thanking the gods I had stayed upright. I managed a bit of a revival towards the end and along with Sean Yelverton hit the front with 2km to go in order to set up our sprinter Dion who managed a strong 2nd. It was only after crossing the line did I realise how bad the carnage really was as one by one my battle-scarred team mates limped across the line. I knew the Burren wouldn't be the most forgiving landscape after viewing the weather forecast of 105kph gusts for stage 4 and it was always going to be a brutal affair with several leg breaking climbs along the route. We rolled over the first climb nicely until the American Hot Tubes team started blocking the bunch on the narrow roads and the speed plummeted. I just about saw the right hand turn before we got there and did everything to be at the front for when that crosswind started hitting us. The speed rocketed after the turn and I had a much better understanding of a line-out before long as the Americans strung out the bunch, working in an echelon. I was left pinned in place as the race splintered and we were buffeted by the howling gales. I threw caution to the wind (literally) on the descent and made it back to the bunch as it regrouped before corkscrew. The bunch settled down as we were back into a headwind and feeling pretty good I moved up the inside of the bunch as we hit one of the last hairpins but suddenly found myself slipping and sliding on the inside before tipping over and hitting the deck. I was on my way again a few seconds later but there was no shelter to be found from the raging headwind as I watched the gap to the bunch slowly grow over the top of the climb on a very exposed section of road, my GC hopes fading away eventually I was caught by one of the grupettos. I took a few deep breaths and recovered over the top of the Cliffs of Moher before hammering it on the descent and the whole way to the line on the front of the group, taking out my frustrations on the road. I rode off the front of the group in the final metres but still lost close to 15 minutes. Stage 5 was a great stage and we spent a good period at the front of the bunch to bring back the break which was really cool. The first half of the stage was fast but flat so it was manageable despite averaging 46kph until the first of the drags started 30km in. The climbs got progressively harder with the last 3 promising to be real leg breakers and they did not disappoint. The cat 3 over Broadford had me suffering hugely, mid bunch but Windy Gap was excruciating and I was the happiest man alive when I saw the flag marking the summit after 5 very painful kilometres of climbing. I recovered enough on the descent to attempt to bridge the gap to the 2 Americans up the road but the bunch reeled me back before we hit Gallows hill. There had been some sense of control over the other climbs but it was truly every man for himself as we battled the gradient on our way to the finish line, emptying the tank completely on the final ramp to the line. I started the final stage feeling very strong, following a few moves and helping bring back a few breaks in order to set it up for a sprint but that wasn't to last as my chain came off just before the finish on the 3rd lap. With it refusing to go back on, I was forced to stop in order to get it back on and I was on my way back to the bunch before long when disaster struck, the chain jammed, ripping the derailleur off and into the wheel, the whole bike jammed up and I went into a huge skid desperately attempting to keep the bike upright before my rear tyre blew out spectacularly. I finally got going on my spare bike and was then faced with the mother of all chases to make up the 4 minute deficit on the bunch. I made it back on after a full lap of eyeballs out chasing and was well and truly exhausted after my effort but just about made it to the finish in one piece (the same cant be said for my poor bike). The Junior Tour was a truly unforgettable experience between the racing and the craic in the hotel with the team and I'm already looking forward to next years edition. The Tralee Manor West GP was held today in ideal racing conditions. This years race was selected as part of the prestigious 2015 National Series with just under 200 riders signing on. The Tralee Manor West GP is just in its 3rd year but is becoming an extremely popular race on the Cycling Ireland calendar. The underage racing was as ferocious as always, and in particular the under 12's, which saw Patrick Galvin from Killarney CC rip the competition apart with a huge solo win. Definitely one to watch for the future. The under 14's was won by the young Castlegregory cycling legend Tom Moriarty riding for O'Leary Stone/ Kanturk team. In the under 16's race Robbie Walsh of Cork County took first place. Cian Smailes of the host club, Tralee Manor West BC took 4th place. The A4 race which had four laps of the testing circuit was won by Freddie Stevens of Orwell Wheelers in a very strong performance. The A3 race was won by Darragh McCarthy of St. Finbarr's club in Cork City. The main race of the day for the Michael De Staic Memorial Cup was a gripping affair, with plenty of attacks and counter attacks as the riders completed the 8 laps which took in Bullock Hill, a gruelling 9 times. Mark Dowling won this years race in very impressive form. This is Mark's second time winning the event. With one lap to go it looked like it was going to come down to a two man sprint between Mark Dowling and fellow breakaway companion Daire Feely of iTap but Mark attacked strongly to stay clear in an impressive solo victory. Daire finished second and Tralee man Sean Lacey of Aquablue held on for third place. Tralee Manor West BC would like to thank all our club members who were involved in the race today as stewards, sign-on, lead cars, etc. It is with thanks to you that the race was run safely & smoothly, superb job lads ! Thanks to our sponsors, Manor West Hotel for their support and hospitability and to Brian de Staic Jewellery in Dingle. Thanks of course to the Gardaí and the Red Cross for the tremendous help & support as always. Finally a huge thanks to all the residents on the race route for your great co-operation and patience once again. Shane O'Brien 2nd in Leahy Cup, Ballymore. Great racing today by Tralee Manor West rider Shane O'Brien in the Leahy Cup A4 race in Ballymore. The on form O'Brien was active throughout the race delivering and answering many attacks. It went down to a sprint at the finshline, with Shane storming across to take 2nd place and also earning his A3 spurs. A super performance from this promising rider in his first season of racing. Well done Shane ! Tralee Manor West BC rider Cian Smailes sprinted to 3rd place today in the Noel Deasy Classic in Coachford in the U16s, it was another great show of form by the very talented young rider from Dingle. 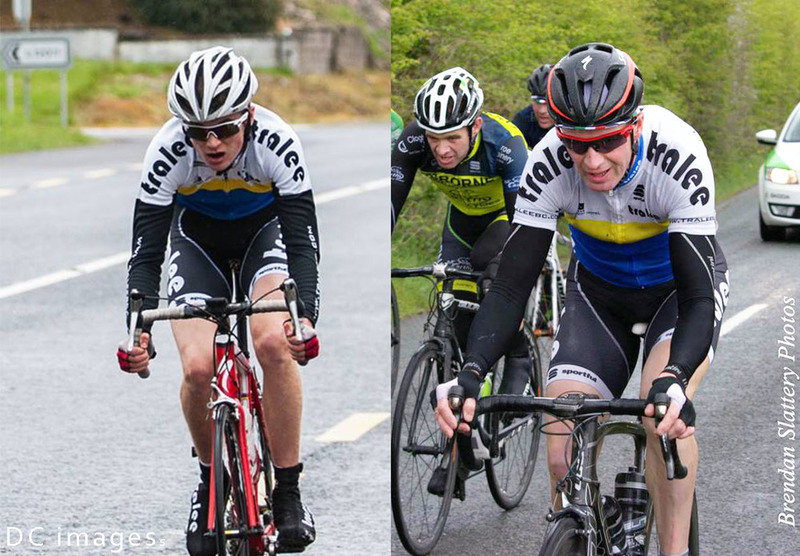 Jerry McCarthy & Cormac Daly were in action in the A3 race, both riders putting in very strong performances. Busy weekend for Tralee Manor West BC riders. First off HUGE congrats to Cillian Tierney for taking 2nd place overall and 1st in the Junior cat in Tri Valentia on Sat, what a super achievement for the talented 17yr old ! Fellow clubman Rob Whyte also blazed a trail in Tri Valentia, finishing 15th overall and 2nd in his Cat. In Clare, Jerry McCarthy & Barry Horgan were racing in the Crotty cup in the A1/A2/A3 handicap race, a tough race with plenty of action. Both riders putting in very strong performances, showing great form. Today Cormac Daly, Shane O'Brien & Teresa O'Sullivan were in action in Whitechurch. Shane took 6th place in theA4 race in another great performance from this promising young racer, Teresa finishing comfortably in the main bunch. In the A2/A3 race Cormac put in another great race, with superb aggressive riding again from the Kenmare man. Many of the club riders who were not racing today, took part in the Humpy 100, organised by Killorglin CC, who again put on another great days cycling, which was thoroughly enjoyed by all of our riders who took part. Great day's racing at the 50th Drumm Cup today in Currow in perfect conditions, hosted by Currow CC. Tralee Manor West BC were well represented with 8 riders racing. First off was Cian Smailes in the U16s, who got into a 3 man break which almost stayed clear until the end, finishing in a bunch sprint with Cian taking a 4th place. In the A4 race Teresa O'Sullivan was just pipped into 2nd Lady home, with Shane O'Brien (making his racing debut) and Mark Ryall finishing very strongly in the main bunch. In the A3 race, Cormac Daly, Jerry McCarthy & Colm Austen O'Sullivan rode very strongly, with Cormac bridging across to the breakaway group on the third lap. The leaders then extended their lead to 1min 20 secs to remain clear to the finish with Cormac taking 10th place. Well done to all our riders and thanks to Currow CC for putting on a great race. Big thanks to Tony Daly for driving the team car again today. Teresa O'Sullivan was in action at the weekend in the 'Visit Nenagh Classic'. This is the 4th running of this extremely tough event held around the roads of North Tipperary and with a town centre finish in Nenagh. There was a huge turnout in all race categories and a tough day's racing took place. Teresa who has already had an impressive 2015 season to date finished in a superb 4th place and a huge congratulations from all your fellow club members!! Congratulations to Club Members Cillian Tierney and Oran Pierse who were part of the Munster Cycling Academy Team at the Gorey 3 Day over the Easter Weekend. The team were 2nd on the team classification, only finishing behind the National team. Stage 4 - Killorglin-Beaufort-Killorglin Town Centre Circuit. 117km. The final stage of Ras Mumhan was held earlier today in Killorglin in glorious sunshine. Jerry, Cormac, Neil and Gareth again lined up for Tralee Manor West. The stage pace was frantic from the start and never let up for the 117km stage. Padi O'Brien made it 3 stage wins from 4 and Lacey Cup winner Sean McKenna won the overall event. Congratulations to Cormac, Jerry, Neil, Gareth and Brian who raced superbly over the event. As mentioned on an earlier post we wish Brian Harte a speedy recovery following his injury. A special mention to Cormac Daly too who racing his first Ras Mumhan finished 2nd in the A3 category which is some achievement. Thanks to Killorglin CC for running such a great event. A big thanks now to Tony Daly who volunteered his time and provided back up to the riders all weekend. Also to Cian Hogan Sports Massage who looked after our riders ensuring their maximum recovery and being fresh for each stage start. The riders mentioned on numerous occasions that the support they got from our club members on each of the 4 stages was exceptional. It gave the guys a huge boast so thank you to all that came out and supported them. Finally, a massive thank you to team manager Barry Murphy. Barry has yet again gone beyond the normal call of duty in preparing the team for this years Ras Mumhan, The months of hard work ensured everything went smoothly for the team.